Integrated Risk Management planning has changed the way Fire and Rescue Services plan and deliver their training. Once upon a time, the Fire & Rescue Service had to be prepared to do the best they could to provide assistance at an emergency and try to save the day. However, with the advent of risk profiling and the development of data gathering we are now able to provide the appropriate response. To that end Fire and Rescue Services are able to develop a more effective Pre-Determined Attendance to the scene of a fire or a non-fire rescue scene. To prepare for such events the preferred option would be to train at the highlighted risk; however, this is not always achievable so the next best thing is to provide a mock-up of the environment where workers and responders can not only test their procedures but also their awareness to the hazards. At our Waddington Training Facility, Lincolnshire Fire and Rescue have developed a number of training rigs, including for confined space, which can be redesigned for a variety of training events, in order for us to ensure that the training we deliver is appropriate to the clients work location. Our initial contact would be a scoping visit to determine if we are able to deliver the correct level of training is required based upon the category of confined space they have and the activity they complete. Once that has been established, we develop a training scenario on the Legal Requirements and the Risk Assessment process and highlight the appropriate safe system of work. We then test these required elements in scenarios based on work activity and emergency response. Our client base from the local industry has benefitted from this type of training as it has raised the awareness levels of the appropriate personnel and has made them develop the specific plans for their site. It has also assisted responders as they now have awareness to the risk and of the individuals who work in these locations. Our Confined Space Instructors have developed their skills through the National Resilience programme and further learning through Industry and engagement with the Health and Safety Executive. Situated on the East Coast of England and being the fourth largest County in geographical area, Lincolnshire has a significant water risk. This was no more apparent than in 2013 following the East Coast Inundation when the port town of Boston suffered substantial flooding caused by the tidal surge during two separate high tides. In fact Lincolnshire Fire and Rescue has attended flooding incidents every year since 2001. Two examples of water rescue training exercises. In preparation for such events, the service decided to organise itself to be able to respond with the most suitable assets. In fact all of our Operational Responders are able to work in or on water to varying levels of competence. The majority of our Fire & Rescue personnel are trained to Flood Response level which allows them to work in water and perform wade rescues. Personnel who work at specific fire stations which perform animal rescues and provide crews for our high volume pumps are trained to Swift Water First Response level. This allows them to enter the water for a specific task and then if they need to self-rescue are able to complete defensive techniques to navigate the environment. Our highest level of response are our Swift Water Rescue teams. These responders are trained to perform dynamic swim rescues and complete rescues using our powered rescue boats. 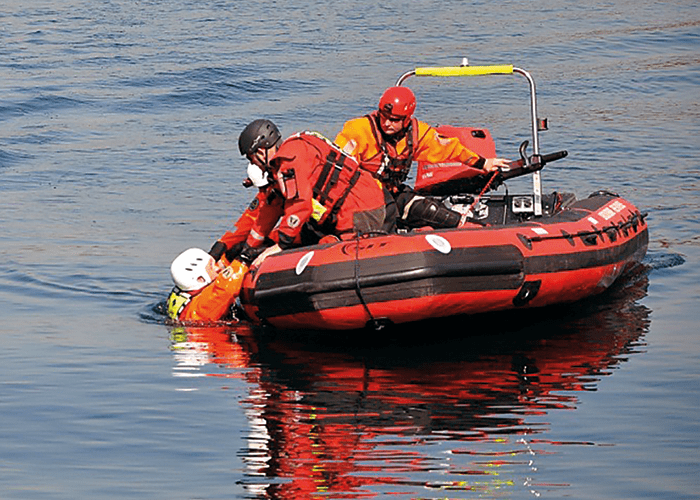 All of our Swift Water Rescue technicians are competent Swift Rescue Boat Operators and are trained to work in fast flowing water to provide an alternative rescue method. To provide suitable training for these skills proved a challenge initially, as Lincolnshire is quite a flat region where the environment does not readily generate any fast-flowing water for training requirements. The majority of training providers for the skill were based in either Wales or Cumbria, so the decision was made to train up our own Instructors by an accredited body. This allowed us to develop our own courses and use water nearer to our locations. We ensured that the water was suitable to the required Health and Safety standards and was challenging enough to test the requisite competencies. Our fleet of Water Rescue craft is one of the largest on the UK’s National Water Asset register and we have been deployed to every National UK flooding mobilisation. We currently have 10 Type B craft, 10 x 16 person rescue rafts and 4 supplementary boats identified for local risks. Spencer Creek has served in Lincolnshire Fire and Rescue for the last 21 years and currently manages three remits: Commercial Trading, National Resilience and Technical Response. He has completed Operational Service at both the Lincoln fire stations and was one of the first Watch Commander Supports before moving into the Training Department where he developed the Operational development programme for Crew and Watch Managers. Spencer has been instrumental in exercise planning in recent years, and was part of the management and facilitation team for Exercise Georgiana which was designed to test National Response to a Rail Crash on the East Coast main railway line amongst many others. He organised Lincolnshire’s response to the National deployment of Flood Resources to the South of England in 2014.